After a pretty significant warm up over the next few days, it's looking more and more likely that there will be a significant winter storm during the late weekend into early next week. This storm looks like it will have the classic cold air damming (CAD) signature, which is always the setup for our significant ice storms in the mid-atlantic. In short, a strong high pressure system over south-eastern Quebec/northern New York will be in place as an area of low pressure develops and tracks well west of our region. Counter clock-wise winds around this low pressure will be in a battle with northerly winds around the clockwise flow around the high to our north. 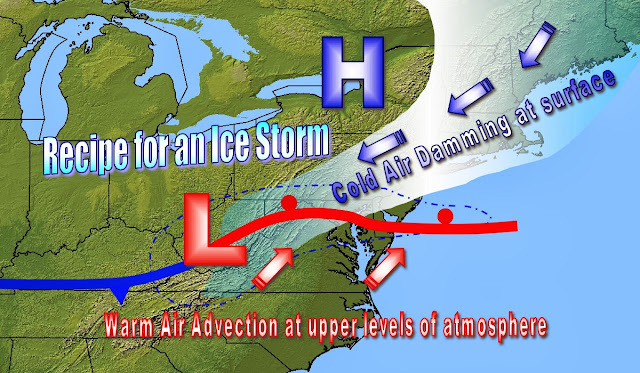 This warm air from the south will overrun colder air trapped at the surface, causing precipitation to fall in the form of mostly rain, but freeze on contact. This is one of the scenarios where the highest elevations will be quicker to change over to rain, while valley areas will hold onto the cold wedge longer. Typically the most favored areas for ice storms with a cold air damming event are in the Shenandoah Valley and just along and east of the Blue Ridge Mountains...but the wedge can stretch as far east as central Virginia. We are now within 96 hours of the onset of event and there is plenty of model agreement. Here's a look a the gfs from 12z surface map for Sunday at 12z (7am). You can see that the 1036 mb high is in a good location over south eastern Canada, with plenty of moisture streaming into the area way out ahead of the low. The isobars making the classic "U" shape along the eastern side of the mountains shows the cold air damming in full effect. If you take a look at the temperatures of the atmosphere at 850 mb below, you can see that areas on a line from Roanoke to Richmond and points north may be cold enough at onset to support a brief period of snow and sleet with this (areas along and north of white line support snow in upper levels). I expect these accumulations to be light, with the best chance for light snow/sleet accumulations (< 2") to occur across the northern Shenandoah Valley. Elsewhere, there may be a quick coating. 12 hours later at 7 pm Sunday afternoon, there will be enough warm air advecting into the region from the counter clockwise flow from the low passing to our west to really warm the upper levels of the atmosphere. This will no longer support ice crystal growth. Below is what the 850 temps will look like by early Sunday evening. The freezing line at 850 mb has moved north of the Mason Dixon line into south central PA. That means that everyone south of this line will now be seeing all liquid precipitation. This is where the High to the north will come into play. Although the upper levels will only be supporting liquid precip, northerly/north easterly winds at the surface will lock cold air in place along and east of the mountains. Below are the surface temperatures for the same time period Sunday 7 pm. Everywhere north of the white line is still below freezing at 2 meters, allowing rain to freeze on contact. The Euro from 12z is pretty similar to the 12z gfs. It has snow/sleet breaking out at onset for northern areas, with freezing rain extending from the New River Valley to just north west of Richmond to Fredericksburg. It too allows warm air to work in aloft and changes everyone to freezing rain by late evening Sunday..shown below. 2) I consider light ice to be a glaze to 0.1"/ moderate ice 0.1" to .25"/and significant ice >0.25"
4) heavier precipitation doesn't accrete as well when surface temperatures are marginal (30+). So this may end up being the case where lighter precip will do more harm than good ice wise. 5) I weighted my map mainly towards the gfs/euro...yes the Canadian model was colder and had more widespread icing problems. I'm not on board with it at this point. 6) I don't see this as being a crippling ice storm (widespread 0.5-1.0" amounts with widespread power outages) due to marginal temperatures and enough warm air working in at the surface before it gets to that point. But once again, any ice is trouble...and there could be scattered outages, especially along both sides of the Blue Ridge Mountains in northern VA.
7) dont let the next few days of warm weather fool you. The front that will slowly move through the region this weekend is a strong one and will drastically cool temperatures. Great, well-thought out post and a good heads up for everyone without Hyping as some others are doing at each model run.